NTT Data Corporation (NTT Data) has provided high-quality data center services for over 30 years. It has data centers not only in major domestic locations, but also overseas, mainly in Asia, supporting corporations supporting global businesses. 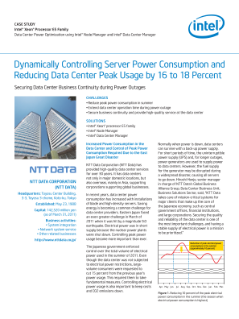 In recent years, data center power consumption has increased with installations of blade and high-density servers. Saving energy is becoming a common ...challenge for data center providers. Eastern Japan faced an even greater challenge in March of 2011 when it was hit by a magnitude 9.0 earthquake. Electrical power was in short supply because the nuclear power plants were shut down. Controlling peak power usage became more important than ever. The Japanese government enforced control over the total volume of electrical power used in the summer of 2011. Even though the data center was not subjected to electrical power restrictions, large-volume consumers were requested to cut 15 percent from the previous year’s power usage. This required them to take fundamental measures. Controlling electrical power usage is also important to keep costs and CO2 emissions down.